FreeFixer is a free tool to remove all potentially unwanted software like spyware,viruses, Trojans, rookies and adware from your Windows 8 PC. This free tool to remove unwanted software scans all the areas where the number of application or software’s has any record of appearing without leaving any trace. FreeFixer doesn’t know which are the bad setting or files on your Windows 8 PC. Hence, you need to take care while deleting files or software. Perhaps, if you remove a legitimate files from your Windows PC, then this may corrupt Windows. 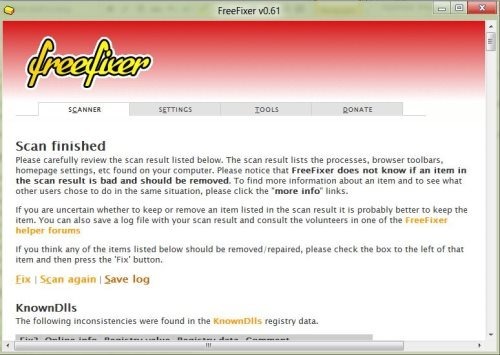 For assistance in removing bad files or settings, you need to check out additional information on FreeFixer website for all the scan result before removing it. Helps to remove all potentially unwanted software’s. Present the total scan results. Removes spyware,viruses, Trojans, rookies and adware. Fixes all the scan reports. Provide additional information on FreeFixer website for all the scan result . Safe and secure tool to use. Saves the log report on your Windows 8 PC. Also, check out our post on PhotoScape Image Editor in Windows 8. Head over the webpage to download FreeFixer on your Windows 8 PC. Click on “Download FreeFixer here”. Execute the download file on your PC. Process with further instruction to complete the installation. FreeFixer is a remarkable tool to delete spyware,viruses, Trojans, rookies and adware. Be careful while deleting the file, check out the additional information on FreeFixer’s website. Try FreeFixer on Windows 8 PC.